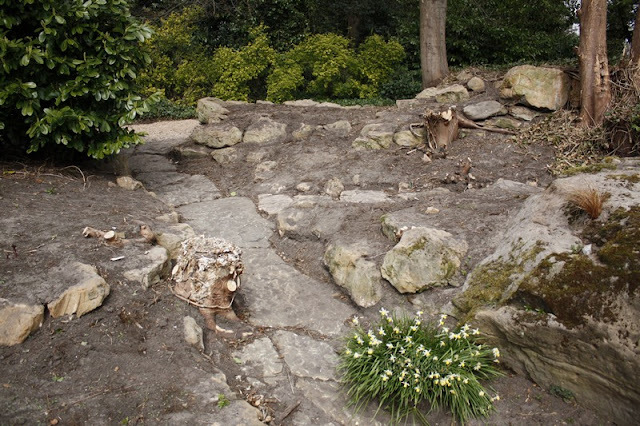 I promised to tell you the story of the lost and found rock garden! Back when I worked at the University of Nottingham, there was a hillock with a sandstone cliff, topped by a ruined summerhouse - all sounds quite romantic. But this was neglect of the worst sort, a thick woodland of sycamore, swagged with heavy ivy. I knew there was the vestiges of an old rock garden under a thick blanket of leafmould but with a limited budget, there was never money available and quite frankly, I didn't really know what to do with it. 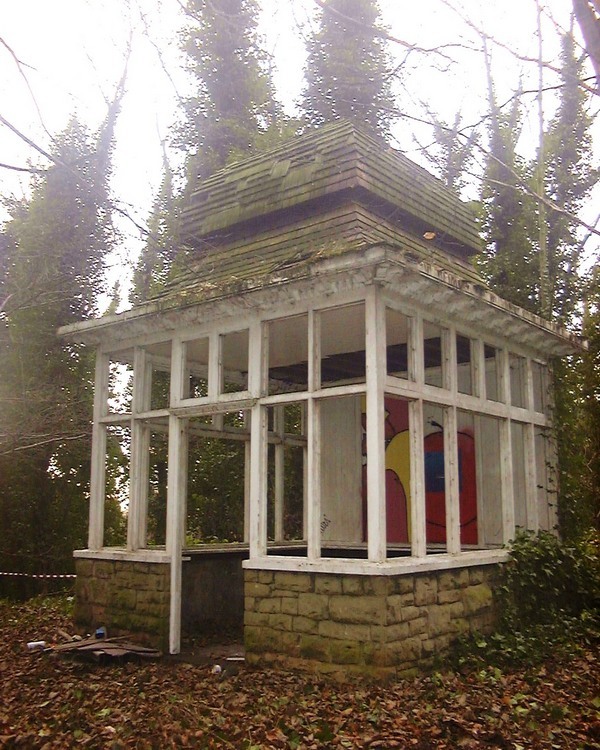 Derelict but basically intact - one venerable academic could remember marking exams within its leafy seclusion many years ago! One year, I finally applied for a grant to refurbish the woodland, with the general thought that I'd reduce the sycamore and add some native tree species. Volunteers from the Friends of University Park wanted to get involved and started one Saturday, slowly clearing the undergrowth. In many places there was between 30-60cm (1-2ft) of dense leafmould, an accumulation of many years! Underneath, we found beautiful sandstone paths, steps and rocky outcrops. The volunteers were ecstatic - their own Heligan! 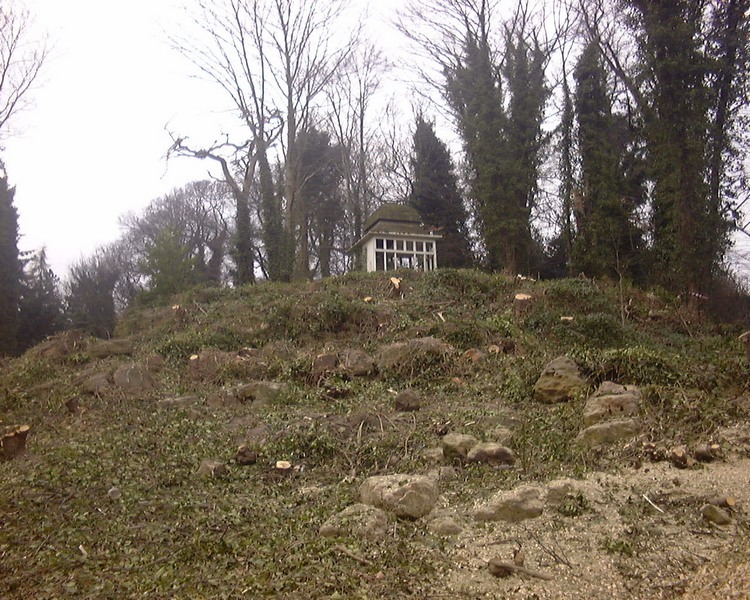 The grant was approved and spent on tree surgeons, who arrived with buzzing chainsaws and a roaring woodchipper that rapidly cleared the sycamore growth of many years, revealing a bare hillside and the bones of an enormous rock garden. Initially it looked a huge raw wound on the landscape and generated lots of comment, not all complimentary! 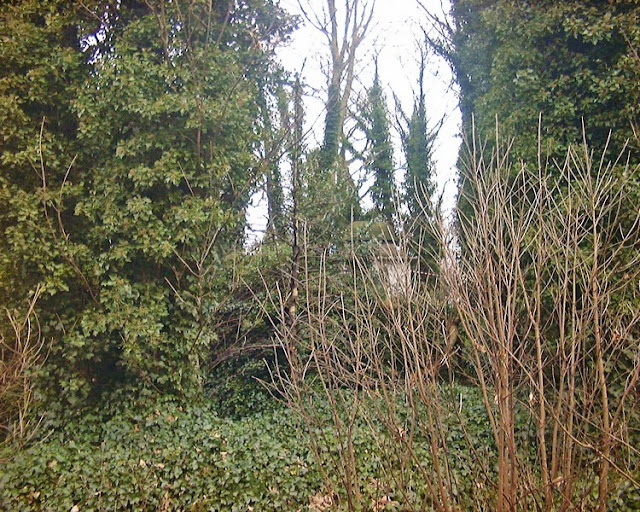 At that point the University 'authorities' demanded an explanation for my arboricultural vandalism and a management plan for the area. 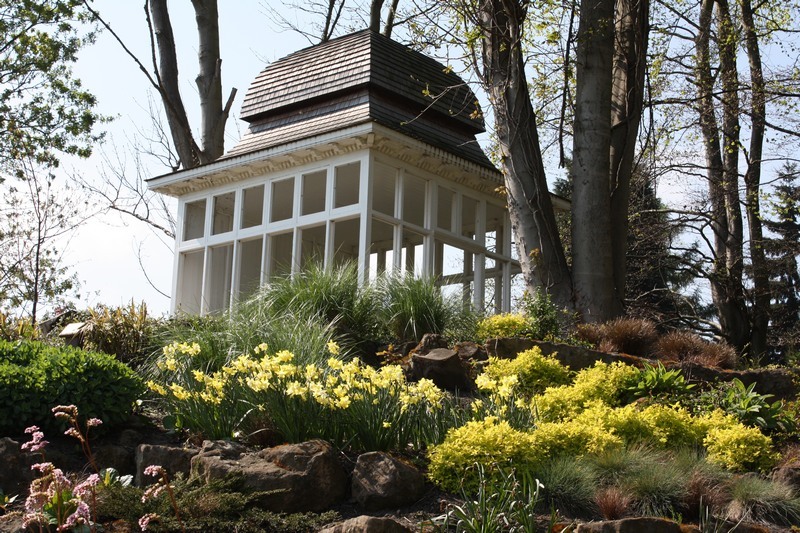 Another grant from the University Development Office enabled us to go ahead and restore the beautiful little summer house with its curved roof and timber shingles. 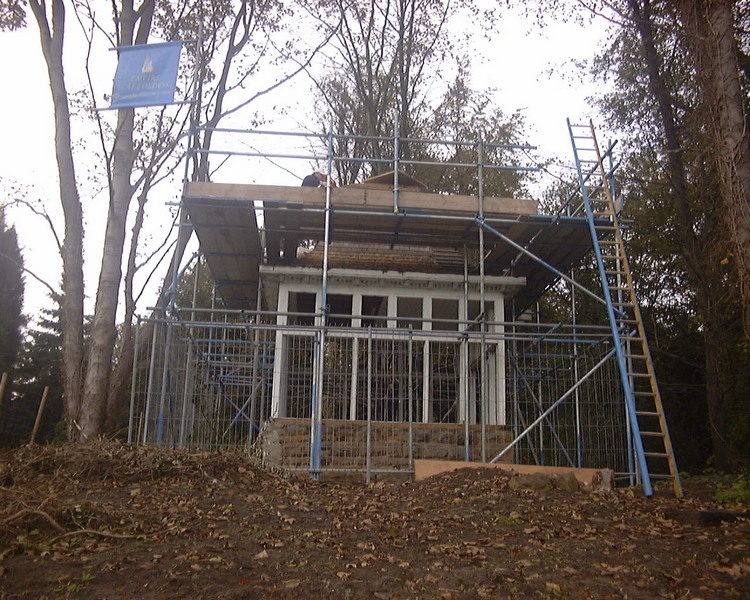 The summer house must originally have had doors and windows but we made the decision to restore it just as an open shelter and without seats. Students have been known to have parties and 'other activities' in secluded areas and this we did not want to encourage! Since I left, the Friends have installed a seat in the summer house and I have to admit it's a lovely vantage point to sit and gaze! 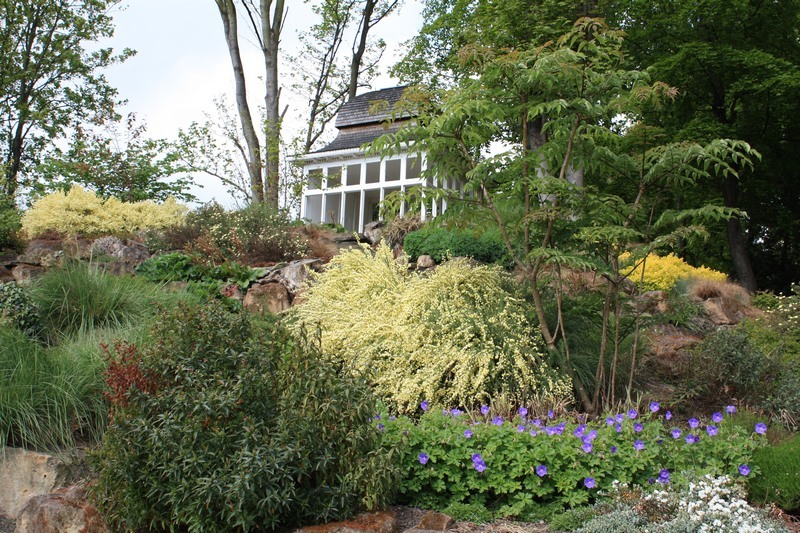 We planted up the rock garden in stages over two winters. 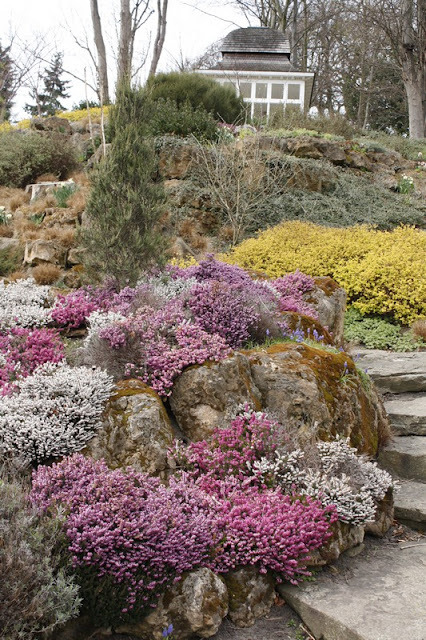 To be correct, this should have been planted with thousands of small alpine plants, requiring hours of skilled maintenance which was not possible. 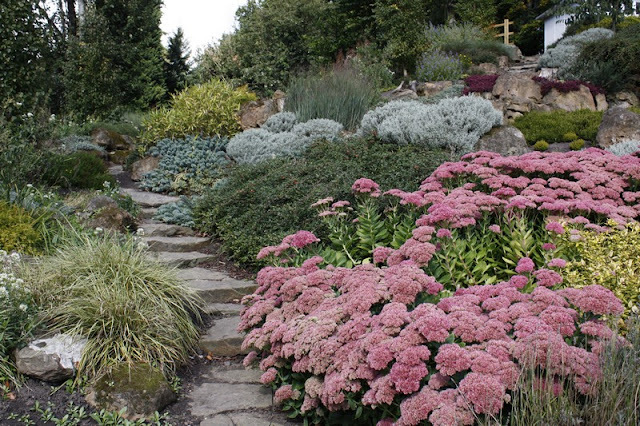 Instead we chose compact shrubs and low growing herbaceous perennials which would thrive with low maintenance. 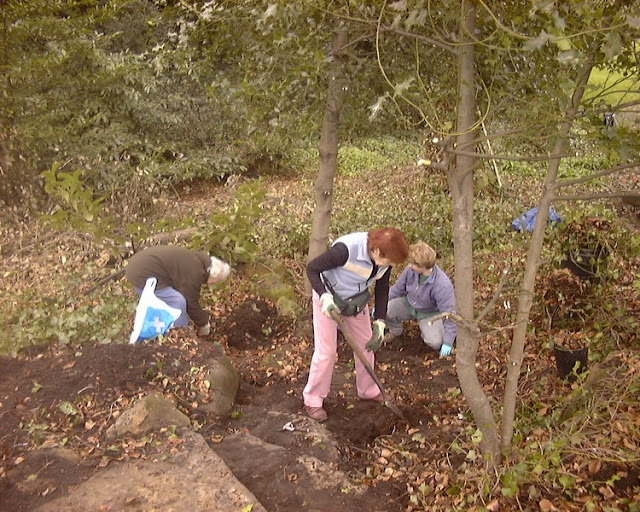 Enriching the soil was not necessary as all the planting pockets already had a generous supplement of leafmould. Small bulbs were added for spring colour. During all this activity, we also tried to research the garden's history. 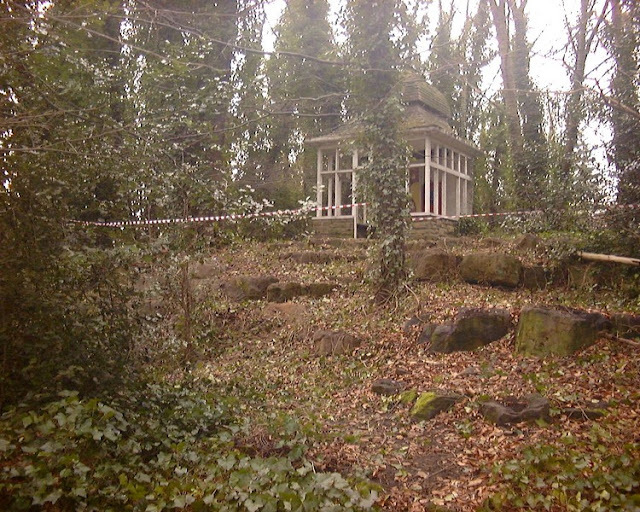 The rock garden was part of the grounds of Lenton Firs, one of the old Victorian estates that eventually went to make up the modern campus. 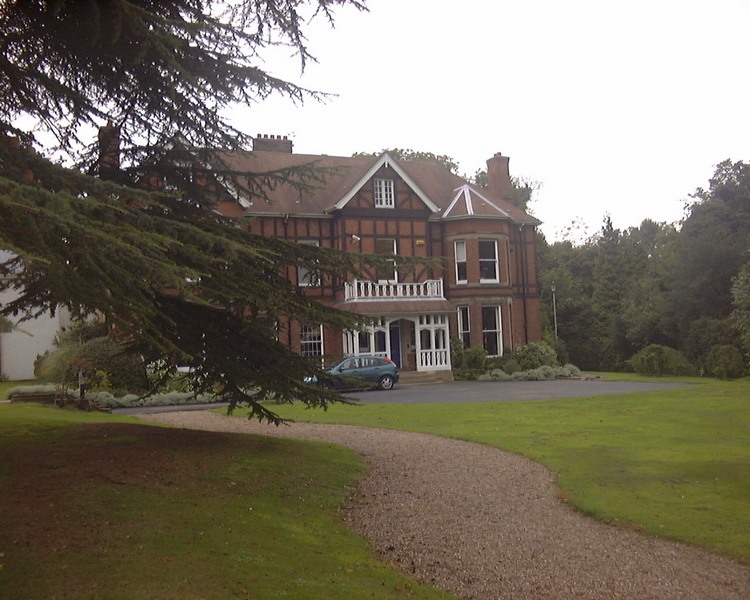 The house was originally owned by the Shipstone family, local Nottingham brewers. 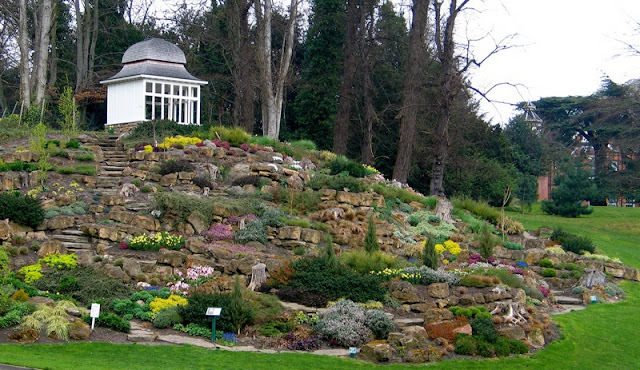 One would expect that a rock garden extending to nearly an acre would have been quite a feature in its prime and would have been documented or photographed many times. However despite extensive searches in the University and local archives, back issues of periodicals such as Country Life and other garden history sources, we found nothing. An article in the local paper generated just one response from an elderly gentleman who remembered the garden from his childhood when his grandfather worked there as a gardener. 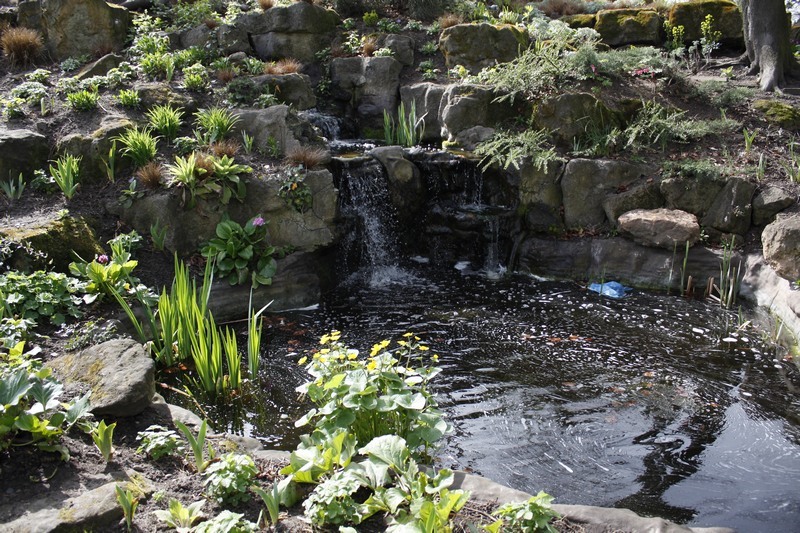 He recalled it being called the Chinese Garden and was still in good condition in the 1930's. He had been allowed to play there as long as he behaved! 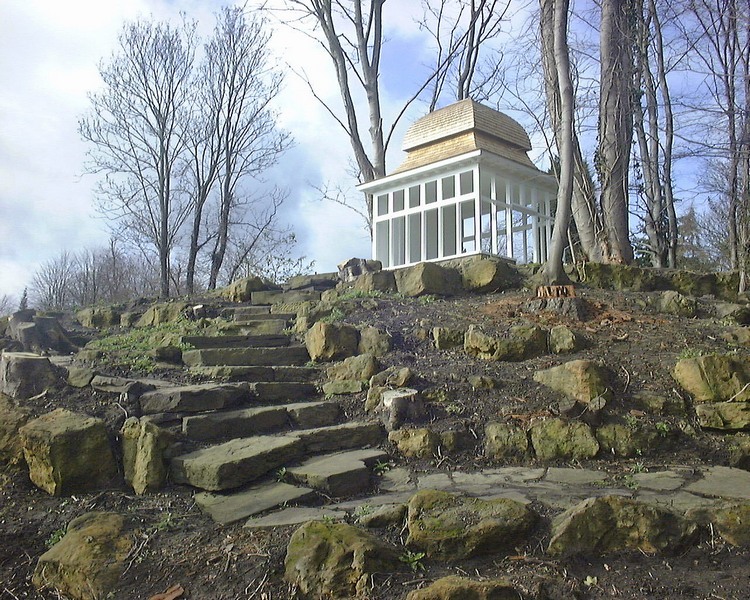 Strangely, although there is a natural sandstone cliff as part of the garden, the rockworks and paths are made from an imported, rather than local sandstone. We conclude it was constructed somewhere around the late 19C or early 20C and probably became derelict in the 2nd World War. 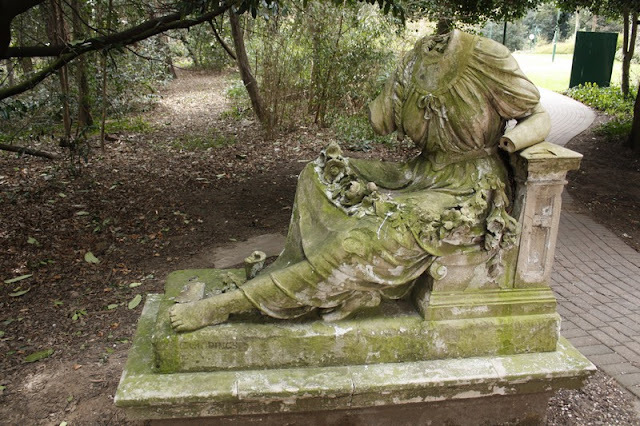 Deep in the woods behind the rock garden is a headless statue of a lady - I wonder what she could tell us of the history of the garden! Worthless and incomplete but she was once very graceful! Over the years, the rock garden has settled down to be quite a feature within the University landscape. The staff saw its potential and care for it with great pride. One feature remained derelict, the small cascade that ran through the garden to a pool at the edge. This structure was curious, being made of some composition, possibly Pulhamite. This was a unique cement like mixture that was manufactured and used by James Pulham and Sons who created numerous garden features and buildings in the late 19C and early 20C. Sadly this could not be verified. 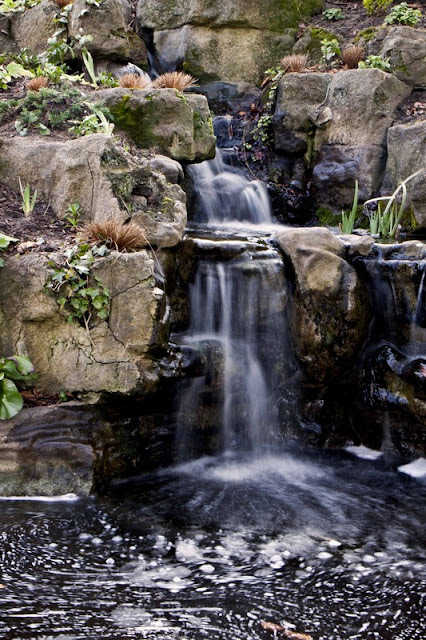 Just before my retirement five years ago I approached the Director of Estates, requesting cash to restore this as my parting shot and he agreed, so finally the pool was sealed, a pump installed and the cascade flows again after being silent for probably 70 years. 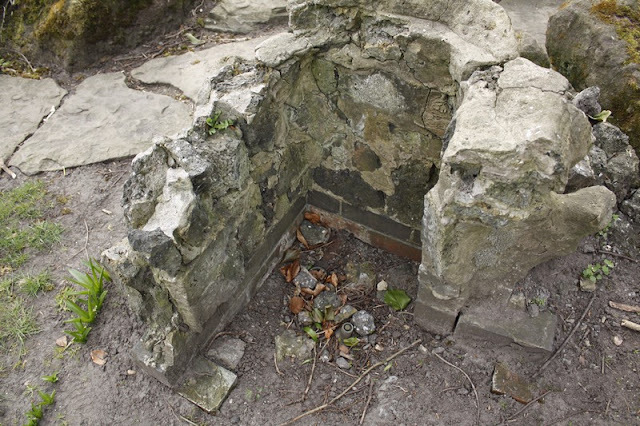 Remains of the original plumbing tucked inside a false rock shell, the inside of which you can see. Not exactly the Lost Gardens of Heligan but nevertheless a restoration project I was proud to be involved with. 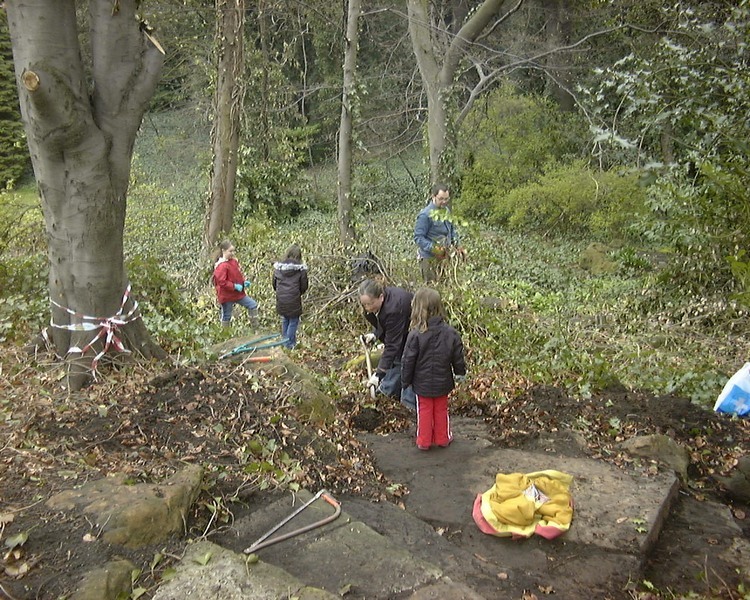 It is good to see that the interest continues and that the Friends have cleared a further area of the old rock garden for replanting. As for me, although I no longer have to worry about budgets, maintenance, weeds and the workers, I would still love to know who built this ambitious garden and when? I had the enormous pleasure of being with Ian throughout the planning and implementation of this wonderful restoration. Even though there were many who commented on the destruction of a natural woodland (! ), there are few now who wouldn't be astounded at the outcome. This restoration is a triumph and seeing its 5 year progress makes me so proud and honored to know Ian and be privileged to be his partner and (in New York State) his husband. I have visited the University Park twice. 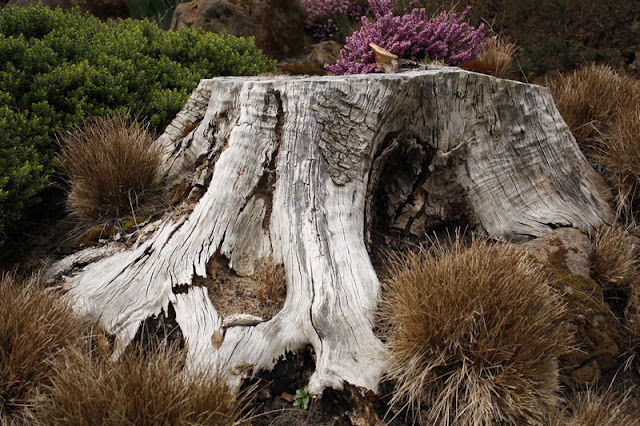 I have spoken to many colleagues of the standard of landscape design and management. Reality, its a model landscape for an Urban Park or even housing and the odd university. Its interesting to see how other universities are improving their own landscapes. Fantastic. Thanks for the kind comments. I was there 14 years but left five years ago so quite a lot has changed. However the University has always valued the landscape and invested in it. We were the first Uni to get a Green Flag and one year got the Britain in Bloom, Best British Park Award.It was a stimulating and rewarding finish to my career! Fantastic work and transformation Ian! 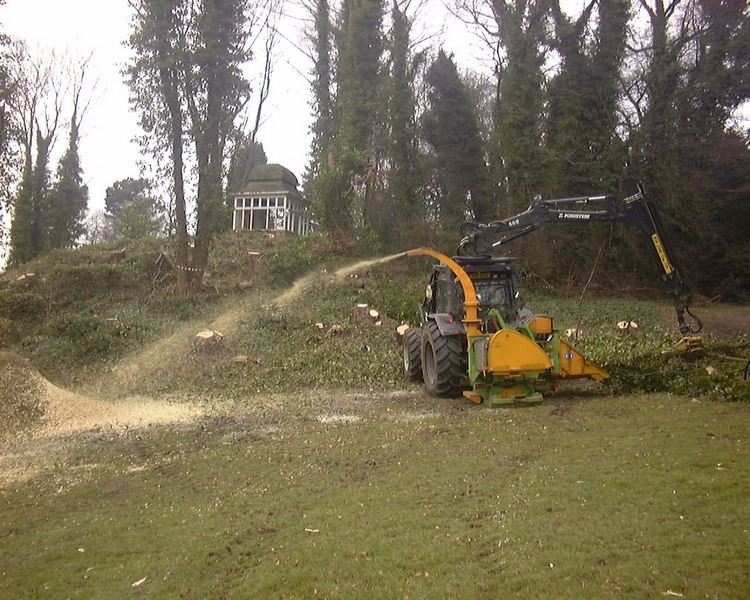 The change and end result achieved with the restoration was quite dramatic, and good to hear that once the work was done and the result seen, it was the motivation needed to keep the area well maintained. A wonderful legacy to leave behind. I can imagine the fondness you must have felt whilst going through old photos in preparing for this post. Yes - it was fun to put together the old photos and see it all together in a sequence. Thanks for your recent comment on this old post - I'm not familiar with geocaching but would like to try this one. How do I start - your link did not work?